Found at roadsides, ditches, railroads, fields, clearings, shores; disturbed swampy ground but not usually in very wet places; disturbed sites including filled land, parking areas, utility rights-of-way, dumps, neglected gardens, etc. Widespread across Eurasia and northern Africa; introduced into North America before 1800. 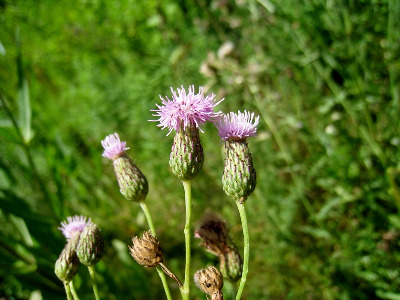 D. Cooley collected Canada thistle in Macomb Co. in 1851, noting “This plant has not yet become troublesome here, but is increasing.” This is a variable species, although most Michigan specimens are the spiny, glabrous var. horridum Wimmer & Grab. as described in the key. A few collections are var. arvense with the upper leaves unlobed and with small spines (up to 2 mm long). We have two collections, from Lenawee Co. (R. W. Smith 747, 4047, MICH), with leaves densely tomentose beneath, at most shallowly lobed, and also with small spines; such plants have been called var. vestitum Wimmer & Grab. White-flowered plants are rare, but have been collected in Baraga, Cheboygan, and Emmet Cos. [f. albiflorum E. L. Rand & Redfield]. This species is dioecious. Plants with only staminate flowers will not produce viable seed (although they may have a reduced pappus). MICHIGAN FLORA ONLINE. A. A. Reznicek, E. G. Voss, & B. S. Walters. February 2011. University of Michigan. Web. 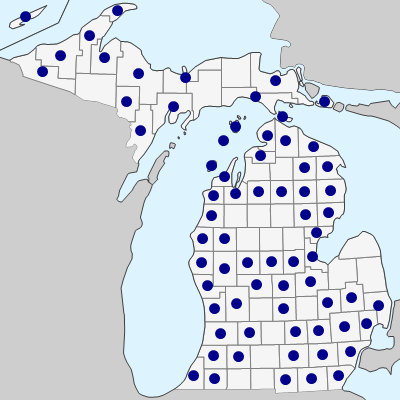 April 21, 2019. https://michiganflora.net/species.aspx?id=284.